Home > ALL CATEGORIES > WEDDING " BRIDAL SHOWER / ENGAGEMENT "
Adorned with a metal umbrella & pink heart charm and beads ... Greeting Card size measures 4 1/2 x 6 1/8 ... includes a hot pink envelope within a clear bag. inside message ... " Wishing Your Dreams Come True "
Adorned with paper flowers and pearls ... Greeting Card size measures 4 1/2 x 6 1/8 ... includes a yellow envelope within a clear bag. Adorned with a metal champagne bottle and beads ... Greeting Card size measures 4 1/2 x 6 1/8 ... includes a pink envelope within a clear bag. Adorned with a lace bouquet and beads ... Greeting Card size measures 4 1/2 x 6 1/8 ... includes a light blue envelope within a clear bag. Adorned with a white dress button and beads ... Greeting Card size measures 4 1/2 x 6 1/8 ... includes a fuchsia envelope within a clear bag. Adorned with a Wedding ring charm ... Greeting Card size measures 4 1/2 x 6 1/8 ... includes a silver envelope within a clear bag. Adorned with a 2 white heart charms and beads ... Greeting Card size measures 4 1/2 x 6 1/8 ... includes a yellow envelope within a clear bag. 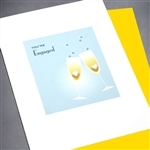 inside message ... " A Toast To The Happy Couple "
Adorned with a Wedding ring and white heart ... Greeting Card size measures 4 1/2 x 6 1/8 ... includes a yelllow envelope within a clear bag. Adorned with metal champagne bottle and beads ... Greeting Card size measures 4 1/2 x 6 1/8 ... includes a yellow envelope within a clear bag. Adorned with twin birds charm and beads ... Greeting Card size measures 4 1/2 x 6 1/8 ... includes an aquamarine envelope within a clear bag. 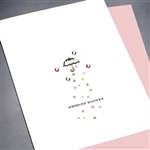 Adorned with a metal umbrella charm and crystals ... Greeting Card size measures 4 1/2 x 6 1/8 ... includes a pink envelope within a clear bag. inside message ... " Wishing You A Lifetime Of Love And Happiness "
Adorned with a white heart and silver bird charms ... Greeting Card size measures 4 1/2 x 6 1/8 ... includes a pink envelope within a clear bag. inside message ... " Congratulations To The Both Of You "
Adorned with a red heart charm and beads ... Greeting Card size measures 4 1/2 x 6 1/8 ... includes a pink envelope within a clear bag. Adorned with paper flowers and mini pearls ... Greeting Card size measures 4 1/2 x 6 1/8 ... includes a light blue envelope within a clear bag.